Eclipse has a very useful feature called Content Assist. When you mouse over a class, method, etc. as small window will appear right next to your cursor. While you can still access the full documentation at mindsensors.com/reference/FRC/html/Java, having it appear in your IDE can be very convenient. If you haven't installed the mindsensors FRC library yet, see our blog post How to Use SD540C and CANLight with roboRIO. 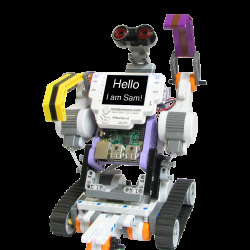 If you don't already have a Robot Java Project, go ahead and create one now. First we need to go to the Properties window for the Java project. Use Alt+Enter, or right-click and select the last option, "Properties." Select the "Java Build Path" section in the left panel. Eclipse actually thinks the mindsensors-javadoc.jar file is a library itself, so select that entry and click "Remove." Now, to put it in the right place, click the arrow to the left of mindsensors.jar (USERLIBS_DIR/mindsensors.jar - C:Userusernamewpilibuserjavalib) to see more detail. Select "Javadoc location: (None)" and click "Edit..." to the right. In the following window select the second radio box, "Javadoc in archive," then click "Browse..."
Start in the folder where you installed the mindsensors Library. Then open the java folder, lib folder, and select mindsensors-javadoc.jar. Your path should be C:UsersUSERNAMEwpilibuserjavalib. Click Open, OK and OK once more to get back to the main Eclipse window. You should be all set! Go copy one of the examples from How to Use SD540C and CANLight with roboRIO and try hovering over a method! One last thing. You see "Press 'F2' for focus" in the bottom-right of that window? Hit that or move your cursor on top of the Content Assist popup. Now a handle appears in the bottom-right that you can drag to resize the window. You can also use the buttons on the bottom-left to open the javadoc in a separate window. Remember, mindsensors.com/reference/FRC/html/Java is always available too! Unfortunately Eclipse may not remember these settings if you create another new robot Java project, but it should be pretty simple now that you're a pro at it! Thank you for reading, I hope this helps keep the fun in your developing.